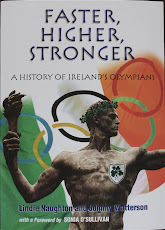 Waterford County Museum presents a talk by Donal Power on his grandfather James Hughes, an Irish international cross-country runner from 1908 to 1916, on Wednesday September 18 (8pm) at the Town Theatre, Priory Street, Dungarvan. Hughes (1884 – 1961) lived at the time when organised sport was in its infancy. His youth coincided with the Olympic Games of 1908 and 1912 when the first running champions were setting their records. He found fame in England, fought as a soldier in World War , suffered an abrupt end to his athletic career, and then returned to Abbeyside, Dungarvam where he owned ‘Christy’s Shop" at the Scouts' den. Donal Power, a well known Abbeyside personality, through his music and recordings, currently lives in Carrigaline with his wife and family.